As a freshman in 1995, he earned All-American honors with a fifth place finish at the NCAA outdoor championships (45.52 seconds) and set a then-school record (45.22) in the 400 meters at the Jamaican nationals. He placed 2nd and set a school record (46.99) in the 400 meters Indoors at the big East Championships. As a sophomore in 1996, he won his first national title in the outdoor 400 meters with a time of 45.29. 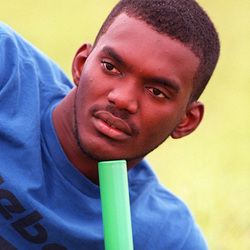 That summer, he would go on to win a bronze medal at the 1996 Olympic Games in Atlanta as the anchor of Jamaica's 4x400 meter relay team (2:59.42). In 1997, he earned All-American honors in the 400 meters with a 6th place finish at the NCAA Outdoor Championships. That season, he broke a 10-year UM record in the 200 meters with a time of 20.66 at the Big East Outdoor Championships. Clarke also won the 400 meters (46.31) and the 4x400 meter relay at that meet. As a senior in 1998, Clarke finished first in the 400 meters Indoors (45.87) and second in the nation in the 400 meters Outdoors (45.18) He finished his UM career with 13 All-Big East honors, one All-Big East Academic honor, and held the school record in seven different events, records that still stand today. including a Gold Medal as a member of the 4x400 meter team at the World Indoor Championships. He retired from competition in 2007.